How do the French say YUMMY? Favorite French memory #2: getting lost leaving Le Louvre... completely famished. Then happening upon the cutest cafe, Cafe de La Comedie Francais on Rue George V. With tiny, sidewalk tables facing the street - honestly one of the best places to people watch in Paris, we lucked out with a back row, corner table. Only a glass partition to my left separated me from the front entrance of the Four Seasons George V (talk about beautiful, shiny, people!). The waiter greeted us in French, but then I asked him for "La menu, s'il vous plait", and without hesitating he immediately started to speak to us in English. Although the weather was beautiful, it was still slightly chilly so I ordered a "chocolat chaud", while my sweety ordered une "bier" (we never did figure out how to say "on tap" in French). 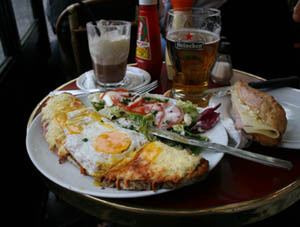 I also ordered une Croque Polaine [basically an open-faced croque monsier, on Polaine (sourdough bread) with a fried egg on top], he ordered a simple Baguette avec jambon et fromage. ...as in how I like my Martinis. 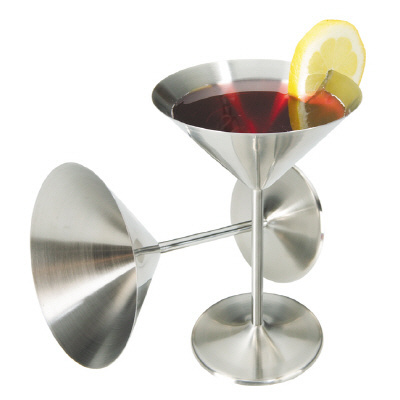 I've been eyeing a supersleek set of stainless steel martini glasses. Run 1 lime quarter around rims of 2 Martini glasses. Place 3 tablespoons sugar on small plate. Dip rims into sugar. Place all lime quarters, 1 tablespoon sugar, vodka, lime juice, and ginger in cocktail shaker. Mash with muddler or end of wooden spoon until lime weges are crushed. Add ice; shake well. Strain mixture between prepared glasses, garnish with lime slices, and serve. Nothing says "I heart you" like cupcakes. And this past Sunday I said "I heart you" to my dear friend and former co-worker Lee and his beautiful (hate her), sweet-as-a-peach fiancee, Kathy with two dozen yummy cupcakes! I volunteered to bring a dessert dish for a farewell party for the happy couple before their move to Greenville, SC. As usual, I waited till the very last minute before I could think of what to bring and I decided on my trusty old, Tiramisu Toffee Torte recipe! (**this recipe is for a torte, but I adjusted accordingly to turn this into cupcakes). I've received tons of compliments with this recipe. Heat oven to 350°F. Grease and flour two 9-8 inch round cake pans. 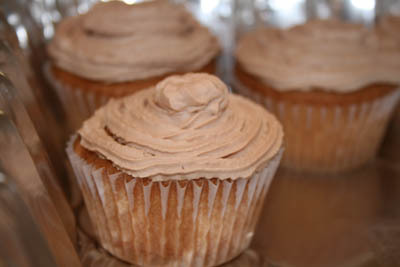 In large bowl, combine cake mix, 1 cup coffee and egg whites at low speed until moistened; beat 2 minutes at high speed. Fold in chopped toffee bars. Spread batter in greased and floured pans. Bake at 350°F. Bake 9-inch pans 20 to 30 minutes, bake 8-inch pans 30-40 minutes, or until toothpick inserted in center comes out clean. Cool 10 minutes; remove from pans. Cool completely. In medium bowl, combine sugar, chocolate syrup (use less sugar if desired, because it can become too sweet w/ the addition of the chocolate syrup) and cream cheese; beat until smooth. Add whipping cream and vanilla; beat until light and fluffy (peaks will form). Refrigerate until ready to serve. To assemble cake, slice each layer in half horizontally to make 4 layers. Drizzle each cut side with 1/4 cup coffee (or coffee/Kahlua mix). Place 1 layer coffee side up on serving plate; spread with 3/4 cup frosting. Repeat with second and third cake layers. Top with remaining cake layer. Frost sides and top of cake with remaining frosting. Garnish with chopped toffee. Store in refrigerator. This page contains all entries posted to veronicafung.com in June 2007. They are listed from oldest to newest.